Labour has today outlined our plans to help end the plight of the tens of thousands of women abandoned to live in poverty by the Tory Government’s changes to their state pension age. Under the plan, Pension Credit will be extended to those who were due to retire before the chaotic pension age increase of the Conservative-led Coalition Government. This would alleviate the worst of the impacts for the most vulnerable women, and restore some of the dignity many of them feel they have been robbed of. 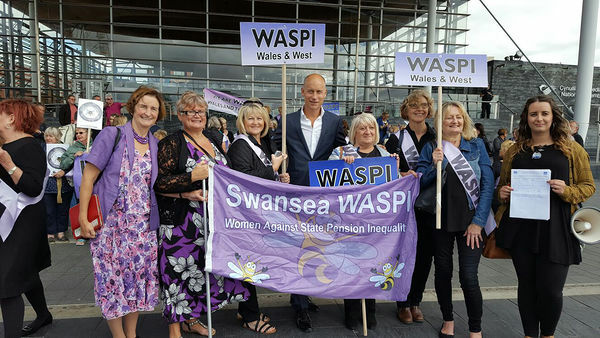 Carolyn Harris, Labour MP for Swansea East said, “The lack of notice given to 1950s women regarding changes in the state pension age by the Government has left many facing real hardship. Women in Swansea East should not have to bear the burnt of Tory economic mismanagement. “Labour are also developing solutions for those affected who would not be entitled to means-tested Pension Credit under these proposals. It is however vital that action takes place now, to end the hardship faced by women in [insert constituency] who have worked all their lives, but find that they cannot retire as planned. The Government’s changes have affected 2.6 million women, who would have retired under the 1995 Pensions Act. Labour plans to extend eligibility to pension credit to these women, ensuring that they are not forced into the Government’s punitive social security regime. The state pension age was increased under the 1995 Pensions Act. This timetable was shortened by the Coalition Government in the 2011 Pensions Act. The Women Against State Pensions Inequality Campaign are a campaign group that fights the injustice done to women born in the 1950s (on or after 6 April 1951) regarding the changes to their state pension age. Labour’s proposal is to return eligibility for Pensions Credit to the state pension age timetable of the 1995 Pensions Act, but with the qualifying age continuing to increase to 66 by 2022. This policy costs 860m over this parliamentary term. Labour will reverse the tax cuts for the wealthy and big business made by the former Chancellor to cover the one-off cost of this measure.